On the Thursday of our visit to Austin, I visited Sustainable Fibers in Elgin, TX. I brought my mom along — she’d never visited a mill before, and we were planning on going to lunch afterwards. We had a lovely time! I’ve visited small mills before, so I was familiar with the process, but my mom was amazed. Jacqueline is fantastic — passionate and incredibly knowledgeable. Her husband, Mark, is a total sweetheart, and a knitter himself. I’m going to be doing a layered lace cami design for them, using some of their lovely mohair blend yarn. On Friday, Dave, my mom & I drove to Wimberley to visit the Old Oaks Ranch. I met Anne, who teaches classes there, and did a small, impromptu trunk show with some of my samples. 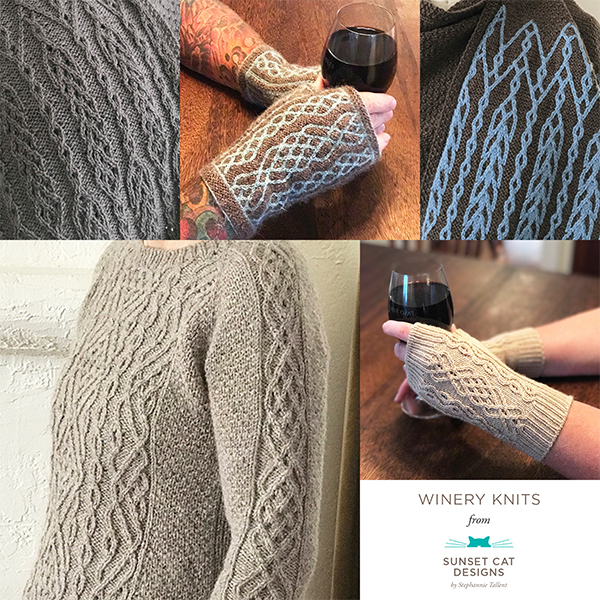 The various fingerless mitts were the biggest hits — Anne is going to plan some classes around them and sell hard copy patterns in the store. My mom enjoyed seeing the alpacas. The Ranch also has a gorgeous sculpture garden, which we explored just before leaving for lunch. Lunch was at the Leaning Pear — delicious! We also visited some of the stores in town (favorite was the rock & mineral store, the Broken Arrow Rock Shop (scroll down)) and Bella Vista Ranch for olive oil and wine tasting. Previous post: It’s the Weekend? !